Prior to visiting Essaouira, I thought Negril Jamaica was the place for spending days on the beach dodging waves and shooting the breeze. Or visiting small artisan shops, listening to the reggae rhythms of Bob Marley, Peter Tosh and the electric guitar groove of Jimi Hendrix. But no, I’m not talking about Jamaica; I am talking about Essaouira, a small white-walled port city on Morocco’s Atlantic coast. 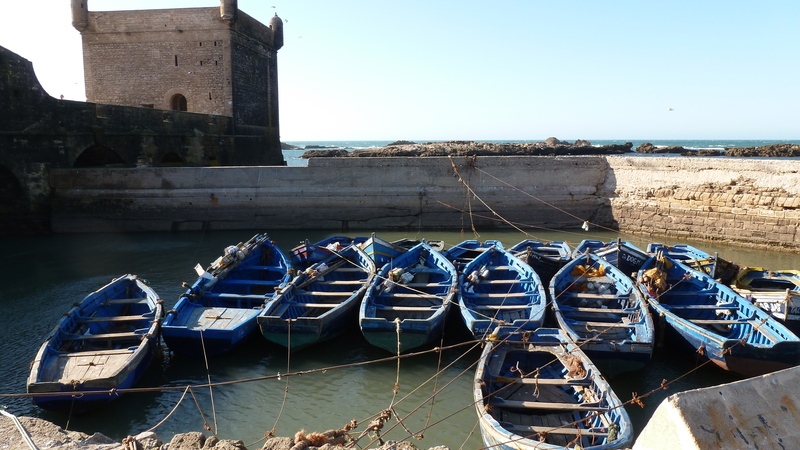 Essaouira has become a favorite on the travelers’ trail of must see towns in Morocco. It is an exotic, cool and laid-back town that is filled with the right attitude, filled with the best playing gnaoua reggae induced rhythms beating through the walls of the hip bars and a medina that is filled with artisan shops. The magic of Essaouira comes from its artistic influence, from Bob Marley to Jimi Hendrix, and scenes from the film Othello, directed by famed producer Orson Welles. The Atlantic Ocean is popular for wind-kite surfing and horseback riding along the beach. When you visit Morocco, why not put Essaouira on your traveling plans, it is only an easy, breezy two hours laid-back drive from Marrakech. This is Sandra with Morocco Why Not. Yes, Essaouira is indeed a beautiful town with its gutsy Atlantic wind, the sensibility of being in a Moroccan city with so much Portuguese and Spanish history and a vibrant music scene fused with traditional gnawa and reggae music. Thank you for reading the article “Easy Breezy Essaouira” and look forward to seeing more articles from us.